Drivers navigate Main at Mill streets in downtown Grass Valley following Monday morning's snow showers which dropped between 6 and 12 inches of snow in places. 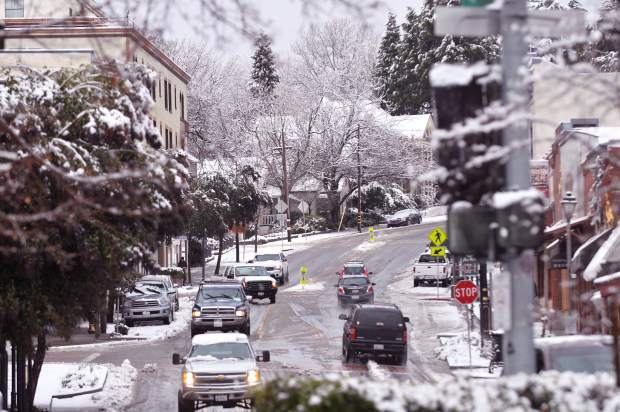 Much of Nevada County lived up to its name today when folks awoke to a wintry wonderland. 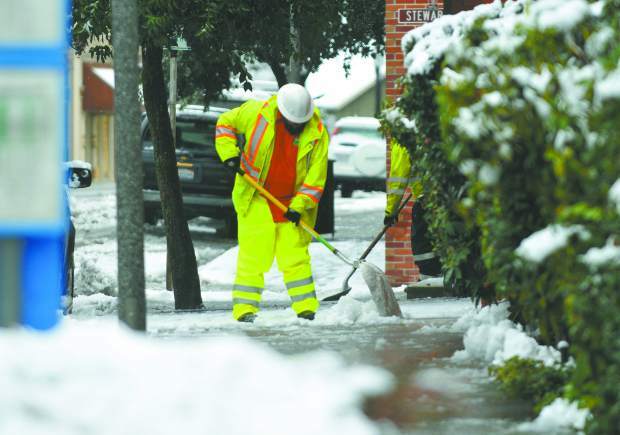 Utility workers use shovels to clear snow from the doors of City Hall Monday morning in Grass Valley. Utility workers across the Sierra were busy clearing up traffic snarls, which included a pileup in front of Lyman Gilmore School, and multiple utility lines down, in one instance trapping a family inside until first responders could rescue them near La Barr Meadows Road. Five year old Maggie Poston walks in the foot prints of her father Dan, made in the snow on the sidewalk along Main Street in downtown Grass Valley Monday morning. Early morning snowfall caused numerous headaches for Nevada County drivers, and peaceful moments for pedestrians. 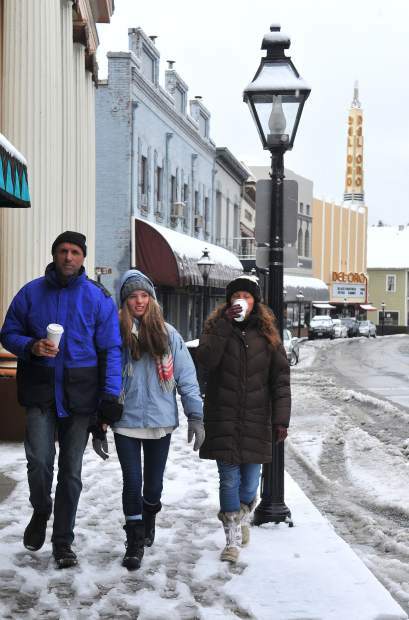 Grass Valley's Paunovic family, including Dan (from left) Lexi, and Maxi, enjoyed the snowy morning downtown while taking a stroll and sipping on coffee along Mill Street Monday morning. 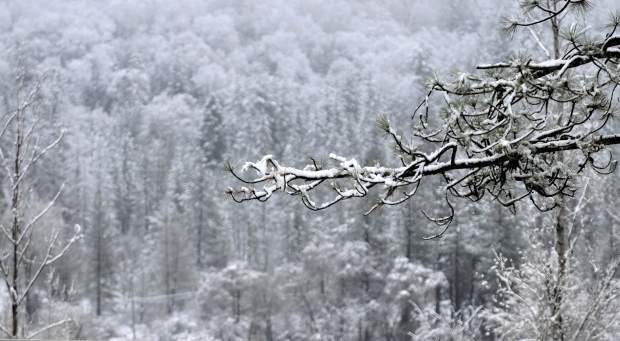 Much of Nevada County lived up to it's name today when folks awoke to a wintry wonderland. Utility workers use shovels to clear snow from the doors of City Hall Monday morning in Grass Valley. Utility workers across the Sierra were busy clearing up traffic snarls which included a pile up in front of Lyman Gilmore School, and multiple utility lines down, in one instance trapping a family inside until first responders could rescue them near La Barr Meadows Rd. 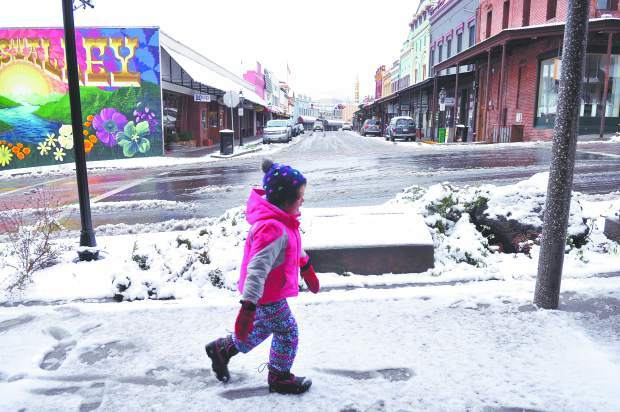 Five-year-old Maggie Poston walks in the footprints of her father Dan, made in the snow along Main Street in downtown Grass Valley Monday morning. Early morning snowfall caused numerous headaches for Nevada County drivers, and peaceful moments for pedestrians. 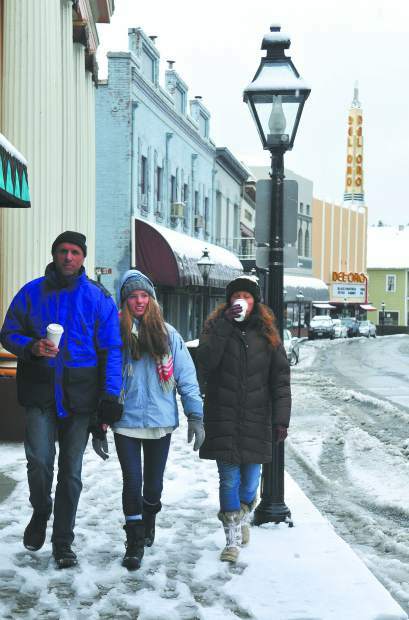 With the closure of area schools and many government offices, folks took to the streets to enjoy a snow day walk along Mill Street in downtown Grass Valley. 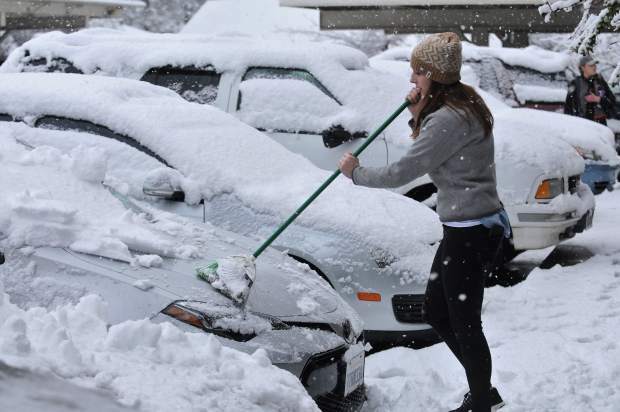 Grass Valley's Sarah Cassidy uses a broom to sweep snow from her vehicle Monday morning at the Oak Ridge Apartments in Grass Valley. While Cassidy works from home and didn't need to leave the house in the morning, she did have a mission to get a hot cup of coffee. 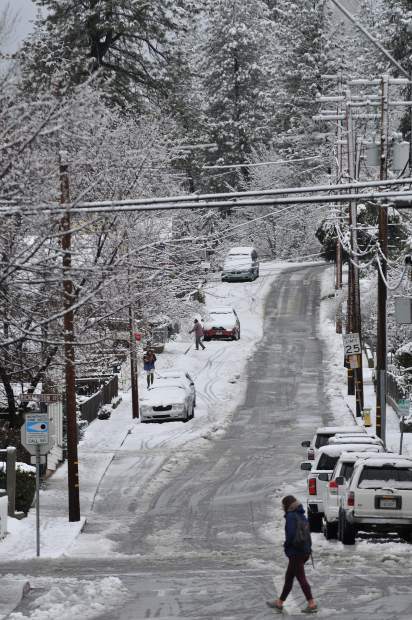 After several false alarms the last couple weeks, much of Nevada County woke up Monday morning to find a blanket of snow on the ground. Most school districts closed for a snow day, although those at lower elevations, such as Penn Valley Union Elementary School District, stayed open for business. 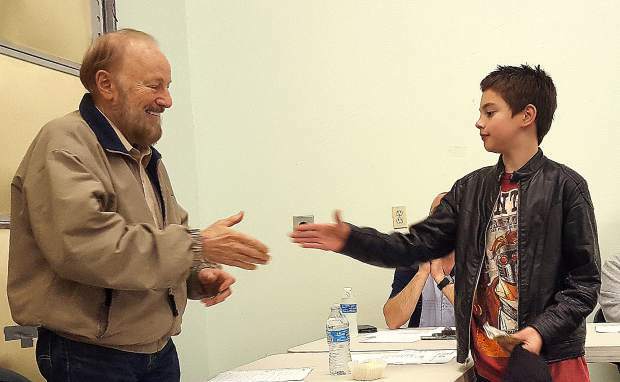 The Pleasant Ridge School District, which encompasses Alta Sierra and Cottage Hill elementary and Magnolia intermediate schools, opened and then closed an hour later due to the worsening weather. According to the district, students were brought to the schools from the buses and parents were informed students needed to be picked back up as soon as possible. Nevada County closed its government offices, although the courthouse remained open. Multiple spinouts and collisions were reported during the morning commute from Highway 20 above Nevada City all the way down Highway 49. No serious injuries were reported by the California Highway Patrol, however. The evening commute was shaping up to be a mess at higher elevations. By 5 p.m., eastbound traffic on Interstate 80 was being held at Kingvale due to spin-outs on the summit. Amounts of snowfall varied widely, with as much as a foot falling at higher elevations. In the lakeside community of Cascade Shores, many of the roads remained unplowed into the early afternoon, with about 8 inches falling by noon. The Cascade Shores General Store was doing a brisk business, although its cafe was closed. One intrepid soul made it to the store on his tractor, grabbing groceries so that he wouldn’t have to brave the hilly road into Nevada City. “It’s been a constant stream, people coming in for beer and for food,” said Patches Murphy, as she worked the register in the store. 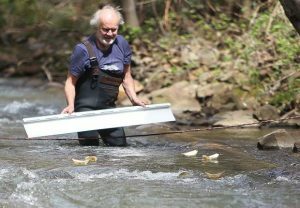 According to Murphy, more than a few visitors came from out of the area. Murphy admitted this was her first big snow since she moved here from Southern California two years ago. Despite calls from some concerned citizens, no warming shelter was set to open Monday night. 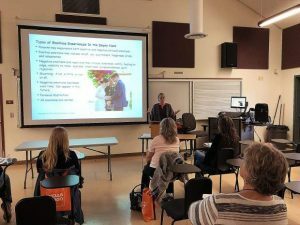 According to a memorandum of understanding between Sierra Roots and Nevada City, the temperature must fall below 30 degrees — or 34 degrees with either snow on the ground or one inch of rain in a 24-hour period — in order for city buildings to be used for a warming shelter. Sierra Roots President Janice O’Brien said she was caught off guard by the storm and had not been able to reach anyone at the city or county until it was too late. Nevada City was able to offer its Veterans Hall for one night only, but O’Brien said the logistics would have been too difficult. 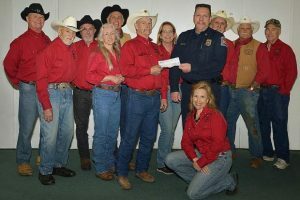 Similarly, an offer by Nevada County of volunteer assistance for Monday night was turned down. O’Brien said Sierra Roots would feel legally responsible if anything happened such as an altercation. O’Brien hopes to debrief with the city and county so that better planning can take place. The shelter at the Nevada City Seamans Lodge will be open Wednesday, Thursday and Friday. The lodge in Pioneer Park will open at 4:30 p.m. each of those days, according to the Sierra Roots website. Today is predicted to be clear, but a second storm is forecast to move into the area Wednesday. Today will be sunny with a high near 50 degrees, according to the National Weather Service. Rain, possibly mixed with snow, is expected Wednesday, mainly after 4 p.m. More rain is predicted for Thursday, heavy at times, with a high near 42 degrees. It will turn colder Thursday night with possible snow showers, the weather service said. 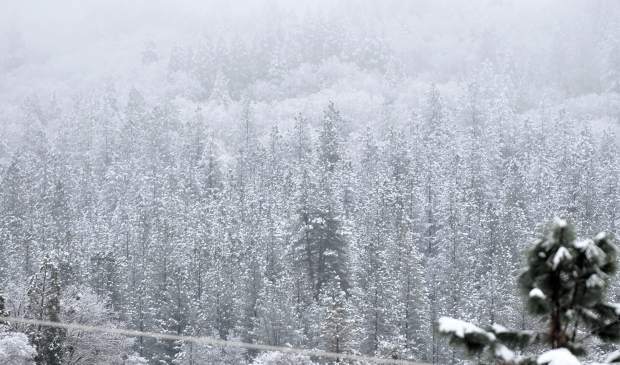 Nevada County could see those snow showers continued into Saturday.